Health centers are increasingly using telehealth to better meet their patients’ needs and to overcome persistent clinical workforce shortages. Because health centers are required to offer comprehensive services in areas of high need, many are using telehealth to address geographic, economic, transportation, and linguistic barriers to health care access. In 2016, 57 percent of health centers across the nation had either begun using telehealth, were in the process of implementing a telehealth program, or were actively exploring its feasibility. Telehealth programs are especially critical in rural areas, where many residents can face long distances between home and health provider, particularly specialized providers. In rural communities, nearly half of health centers utilized telehealth for services outside the clinic. NACHC is working to expand the innovative and successful telehealth programs at health centers across the country by encouraging Congress and the Administration to adopt policies that support implementation and reimbursement for telehealth in both the Medicare and Medicaid programs. Currently, there are limitations on Medicare reimbursement for health centers using telehealth and only 16 states currently have a policy in place to allow health centers to use telehealth in their Medicaid programs. While many health centers have utilized grants and other one-time funding opportunities to integrate telehealth technologies into their practice, reimbursement for telehealth is critical to the long-term sustainability and expansion of telehealth services. That’s why NACHC has endorsed the CONNECT for Health Act of 2017 in the House and in the Senate (H.R.2556/ S.1016). Among other provisions to expand the use of telehealth within Medicare, the CONNECT Act would allow Medicare to recognize health centers as distant and originating sites and allow for reimbursement of remote patient monitoring within Medicare. 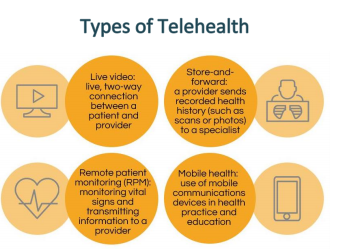 For those health centers that are currently utilizing telehealth services and for those that wish to implement telehealth programs, the CONNECT for Health Act of 2017 is an important step forward in addressing the need for reimbursement for telehealth and remote patient monitoring.